These healthy protein shakes are not just a great way to increase your intake of protein but a host of healthy nutrients as well. They are easy to make and incredibly nutrient dense. This makes them a perfect choice for a healthy, filling breakfast, snack or even lunch. Protein shakes require very little prep time and you can easily take them with you. This portability and ease of use makes them the perfect breakfast on the go for busy people. Protein is also incredibly filling. They will keep you full, prevent cravings and reduce the risk of you falling into the temptation of unhealthy snacking between meals. 1 Why make your own healthy protein shakes? Why make your own healthy protein shakes? Why would you want to make your own protein shakes instead of going the easy route and buying pre-made ones from a smoothie store or grocery store? First of all, store bought shakes often contain a boat load of extra calories because of all the added sugar that goes into them. Secondly, they are often highly processed, containing a lot of chemical additives… which are generally not know for their health boosting capabilities. Last but not least, freshly made protein shakes just taste soooo much better! 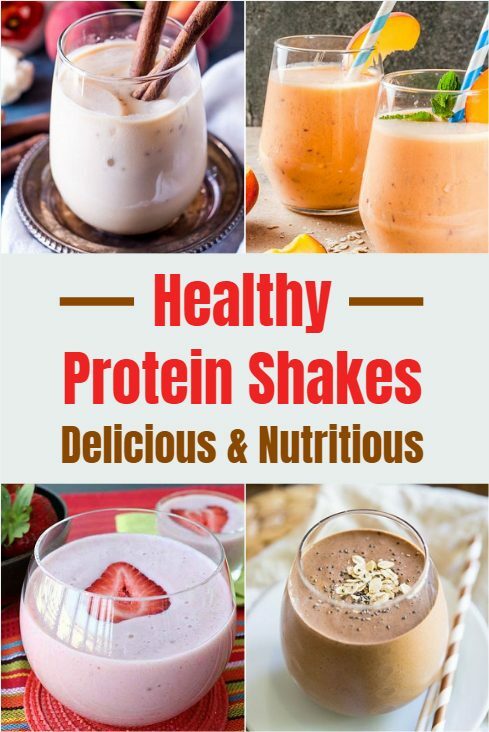 Most healthy protein shakes take only a couple of minutes to make and usually only consist protein powder and a handful of natural, healthy ingredients. All you have to do is put the ingredients in a blender and blend until smooth. This healthy protein shake combines the refreshing taste of strawberry and banana with 25 grams of filling, energizing, muscle repairing protein. This ‘Strawberry Banana Protein smoothie’ is a delicious way to cool down after a workout… or just as a treat on warm, sunny days. it’s especially refreshing when you make it with frozen strawberries. This gives it a ‘slush-ice’ like consistency. The banana gives this healthy protein shake its creaminess. However, if you’re not a banana person you can easily make it with just the strawberries. The other ingredients are vanilla protein powder, flaxseed and water. See the recipe on diabetesstrong.com. 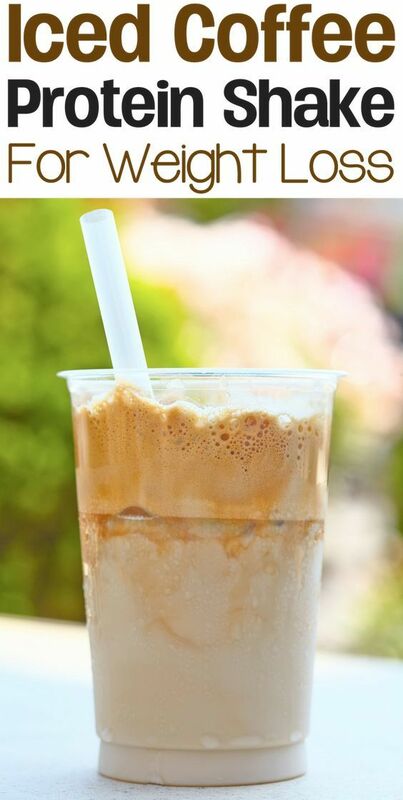 This iced coffee protein shake is low in calories but incredibly rich in protein and other healthy nutrients. This makes it a great weight loss shake for coffee lovers. This is an amazing breakfast shake. Not just because of the caffeine but also because it will provide you with a ton of energy and keep you feeling full for 4-6 hours. Check out the recipe on: somanyrecipes.info. This Peanut Butter Chocolate Protein Shake is filled to the brim with an array of nutritious ingredients that will feed your body, boost your energy and keep you full for hours. It’s also a great post workout shake to feed your muscles after intense exercise. This shake is powered by whey protein powder and powdered peanut butter. It also contains anti-oxidant rich organic cacao powder, chia seed, rolled oats, banana and whole milk (or other milk of your choice). This amazing Peach-Berry Bliss Protein Shake is like ‘summer in a glass’. It combines peach slices and blueberries with avocado and chia seeds. This will provide you with all the nutrients your body needs to function optimally. The protein powder and fiber will help you burn fat and help repair muscle after a strenuous workout. All the ingredients together make for a deliciously fresh and filling shake that is perfect as a nutritious breakfast, snack or post workout shake. Combine your favorite chai spices with the filling goodness of vanilla protein powder. This Vanilla Chai Protein Shake combines delicious, fat burning spices like cinnamon with over 30 grams of protein. It throws in some chia seeds to supercharge its nutritional value. If you are looking for a highly nutritious breakfast on the go that is quick and easy to make, this shake ticks all those boxes. Oh… and did we mention it tastes great! See the recipe on: tastesoflizzyt.com. Strawberries? Cheesecake? What’s not to love! Well, it gets better. 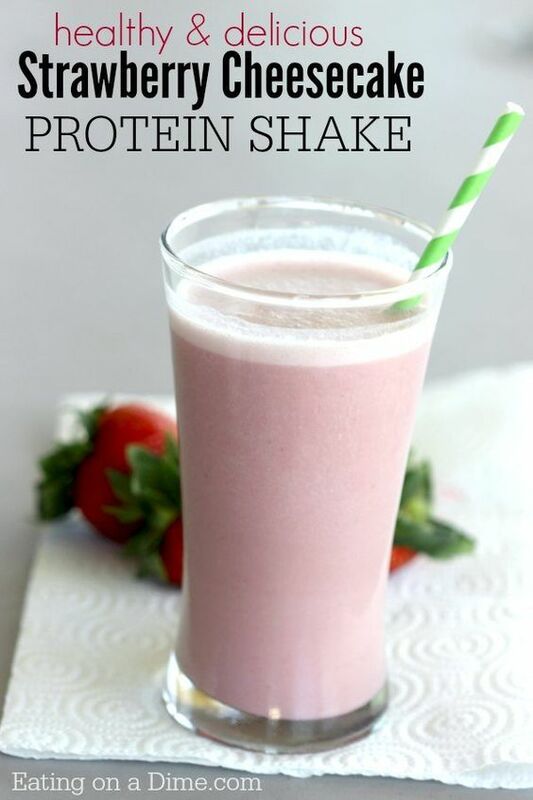 This healthy Strawberry Cheesecake Protein Shake is truly a treat. It literally tastes like strawberry cheesecake… but without all the calories and with healthy protein. 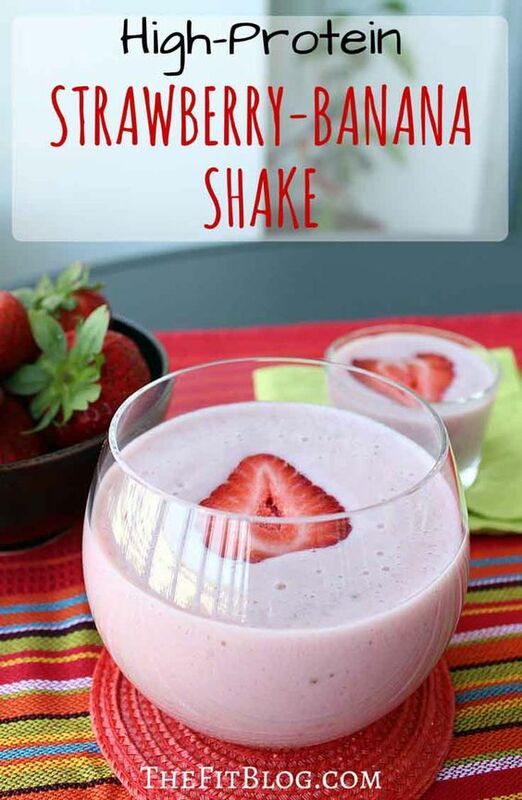 For this shake you can use either fresh or frozen strawberries. The other ingredients are vanilla protein powder, almond milk, sugar free jell-0 cheesecake mix and ice. It’s super easy to make and makes for an amazing breakfast treat that will fill you to the brim with energy and keep you full until lunch. Check out the recipe on: eatingonadime.com. As you’ve probably noticed by now, you definitely don’t need a lot of kitchen experience to make your own healthy protein shakes. A good blender is actually pretty much all you need. 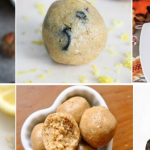 Hopefully these recipes have inspired you to try a protein shake yourself. Be it for breakfast, lunch or as a post workout meal. Bodyweight Burn Review: Does It Really Burn Fat In 21 Minutes?